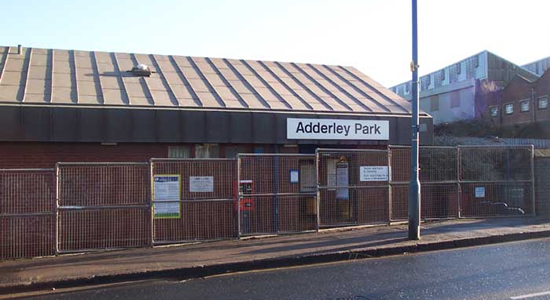 Adderley Park opened in 1860 under the LNWR as the first station out of New Street linking with their line through Coventry and on to Euston. 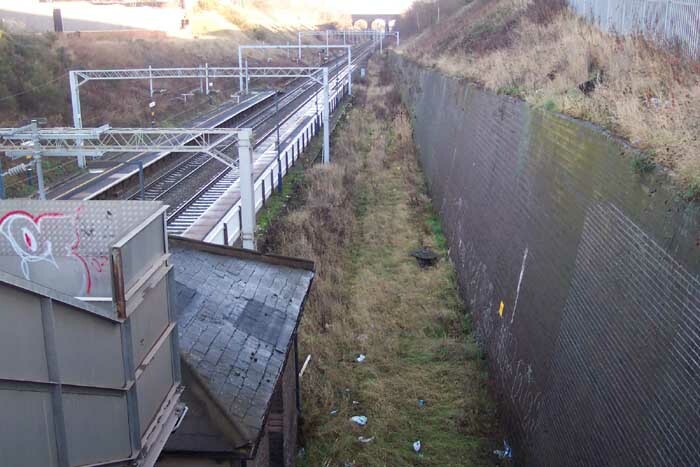 Above we see the 'Fort Knox' approach to station buildings on Bordesley Green Road. 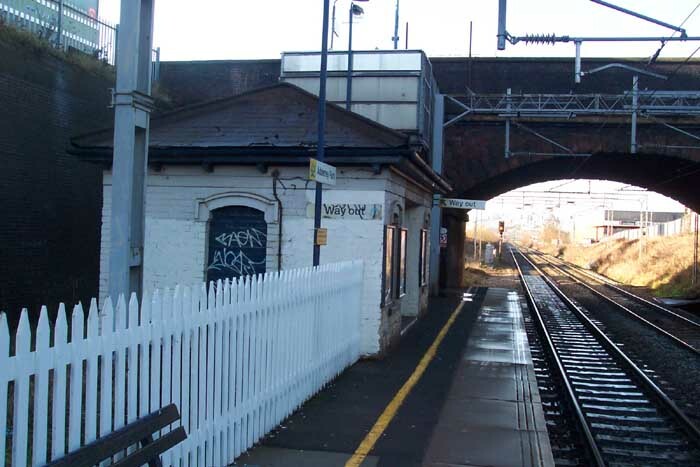 As a product of the 1970s rebuilding of the local rail scene, any charm that may once have existed in the LNWR station building has been swept away in favour of the bland box you see above (see equally as poor architecture at Selly Oak, Longbridge, Five Ways etc . . . ). Whilst I assume that vandalism is a problem here, and that the rather downmarket industrialism of its immediate environs renders any attempt to create something approaching aesthetically pleasing as largely futile, I think a little effort could have been made to brighten it up - for heaven's sake, people coming in to the City from elsewhere have this gloomy pit as an indication of entering Birmingham proper! Above-left the 'gloomy pit'! I admit it was an overcast day but the station was very dark, damp, smelly and graffiti-ridden with the steep blue-bricked side walls relflecting what sunlight there was with a sort of blueish tinge (see the colour version of the photo). We are on the Birmingham platform looking in the direction of Coventry. Above-right we are in roughly the same position as the previous photograph but looking in the opposite direction towards Birmingham. We can see the Bordesley Green Road overbridge and to our left a waiting room and, judging from the aroma, emergency urinal. The metal staircase up to road level can be discerned behind the waiting room. Through the bridge immediately to the left used to be Adderley Park goods yard a not insignificant yard by any means. 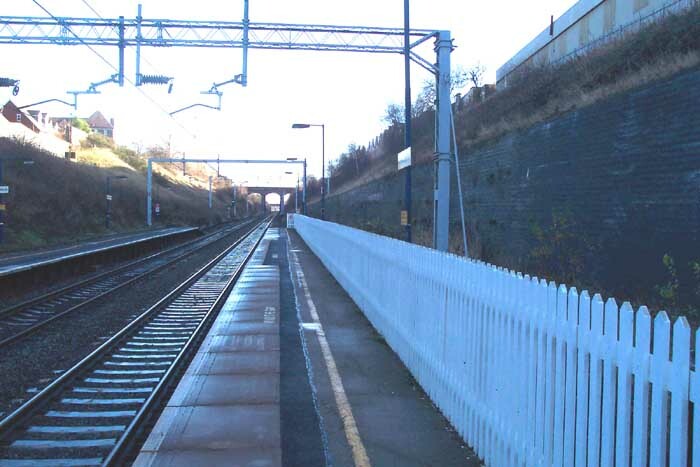 However, the yard has been removed during the last 20 years and the trackbed is now lined by a small embankment to the left. 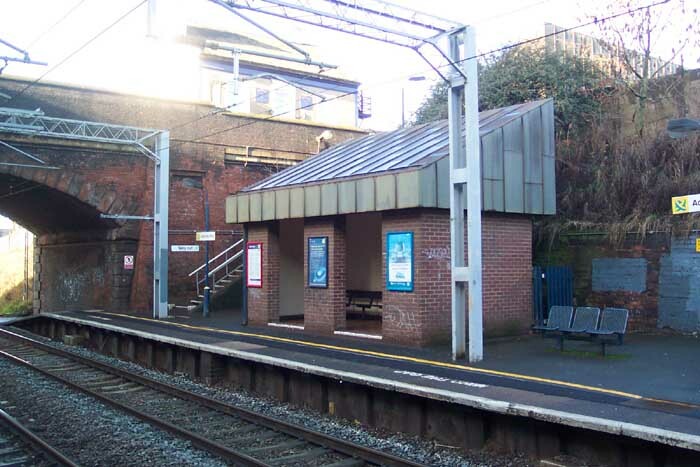 Above-left we are looking across to the Coventry platform and can see the waiting room and above it and to the right (out of shot) is the station building. I assume something of more substance once stood here in LNWR days - note the scalloping of the embankment behind this waiting room. Above-right is an interesting feature - what appears to be the trackbed of the entrance line to the goods yard, long-since lifted.